the tailwind pulled in behind me as i passed the foreland turnoff, and what could have been an endless slog up uiskentuie strand was eased greatly by the strong wind at my back. the jacket's windproofing didn't extend that far round. i'd gained a gap by jumping off the front at debbie's, facing a bit of a cross headwind on the snaking roads leading out of bruichladdich. now as i neared whinpark and the road leading to bridgend, the chasing one or two were nowhere to be seen. i knew there was a chase; you could see it in the faces of the sheep grazing to my left. they hadn't dared cross the road and that's very unusual for such indolent creatures. the bridgend junction was reached in almost no time at all. i must have about one and a half minutes on the chase; i had no idea if my pursuer was alone, or riding in tandem with another. if that was the case, it was hardly likely to add to my lead, so i pressed on past jimmy's and the hotel, now heading into a wind, where the white windproof frontage extending to both arms would stop me worrying about weather, instead of increasing my lead. through the shelter of the trees and a quick right-angled flip up to the left and i was effectively out of sight. the road ahead was now rolling countryside; it was going to be hard-going, but it would be difficult to be seen by any chasers, and with no race radios, out of sight would surely mean out of mind. the colnago master must surely be one of the finest machines on which to keep ahead, even if its orange faux molteni colouring made it hard to hide amongst the greenery of the continuous farmland on each side of the road. 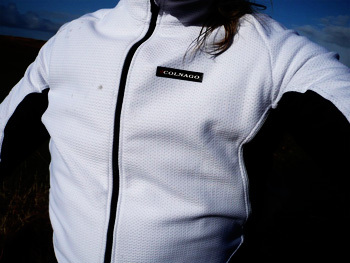 and what else would you wear on a colnago, but colnago endorsed clothing? it might be spring and thus classics season, the very racing to revel in, but at the moment i had the upper hand and clothing that kept my cool and kept me warm. the jacket fleece lined, the bibtights similarly so. fit was impeccable, leaving me free to exercise my honed athletic physique (did i hear sniggering?) in the direction that made most sense. 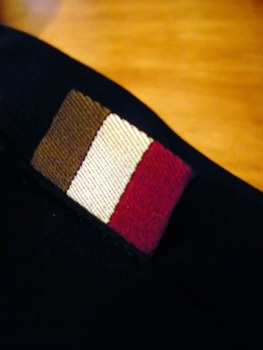 i'd taken a quick look at the handmade in italy tag inside the high collar, and even at the colnago branded hang-tag, but neither gave any indication of the jacket's true worth. was it showerproof? was it waterproof? was it breathable? sometimes it's better to find these things out on the bike; sometimes not. i had watched the dark grey cloud and its impending precipitation heading in my direction as i passed neriby farm and headed down through the village of weak bridge to mulindry and the hairpin bend at cluanach. at this point i would be truly heading into a cold headwind, and that raincloud was disturbing an otherwise pristine blue sky. i needed to push on relentlessly, as they couldn't be that far behind, but riding faster would create a rider/rain interface which, true to form, it subsequently did. the jacket, at least the frontispiece, was water resistant, though those capacious, elasticised rear pockets had comfortably stowed away a stowaway, should more rain protection be quickly required. the other two pockets had a musette and camera (in case it came down to a photo finish). the securely zipped fourth had money in it. now the road was disintegrating before my eyes as i plunged headlong towards the abattoirenberg forest building character at every pothole. judging by the helicopters i could hear overhead (or it could be that stowaway flapping in that back pocket) and the faint notion that following traffic was edging ever closer (or perhaps the cows made more noise than sense), the inseguitori must, by now, have my bib tights and three rear pockets in sight. 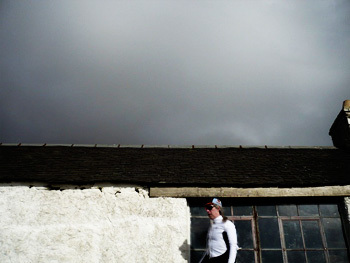 my only hope was to thunder across the cattle grid at avonvogie cottage, indulge in some extra curricular cyclo-cross over the remnants of the junction with the high road and flip it hard right, taking advantage of the tailwind towards the cruach road and an eventual triumphal finish in bowmore. now i understood what was meant by pain and suffering; pain from pushing the colnago as hard as my spindly legs would allow, and suffering because i had no idea just how close anyone else actually was. the only real worry was the hill at tallant, but i was sure that if it was hurting me, it was hurting my chaser(s), and once past tallant farm, it was all, quite literally, downhill. there's a young fellow-me-lad round the corner from washingmachinepost cottage who used to own a ford focus, less than tastefully decorated with all manner of self-evident decals. these not only proclaimed that the car was indeed a ford focus, though now writ large, but that apparently the michelin ascribed tyre sidewalls, at least according to more stickers on the front wings, were supplied by michelin. this vehicle has now passed into someone else's history, and been supplanted by a bright yellow, but never very clean seat sporty thing with red painted disc calipers behind alloy wheels. no stickers, but yellow has never been renowned for its indiscretion. i am of the confirmed opinion that a colnago, of whatever hue and cry, resides within the upper social strata of italian bicycle lore, and should be treated with reverence. similarly any branded clothing with which it may be associated. there is need not for loud proclamation; the cut of the jib is enough to advertise the quality of the ride. eschewing previous incarnations of colnago branded clothing, the new range states little but says much. 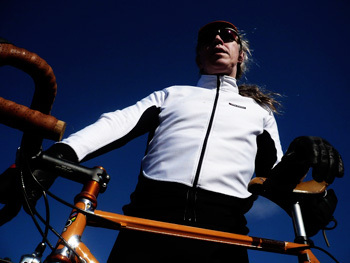 both jacket and bib tights have only one small, rubberised logo apiece. aside from the black on black of the elasticated hem on the jacket it is a case of say no more. that it should be thus is entirely appropriate. the winter bib tight features a fleece lined interior, seam eliminating inserts behind each knee, an elastic padded insert and substantial body coverage front and back, with a zipped front panel. available in black only from small to xxl, they retail at £149.95. available from any authorised colnago dealer. if you own a colnago, you owe it to yourself to dress in colnago head to toe; this is some of the finest and most comfortable race-fit clothing it has been my pleasure to ride in. comfort is impressive and the fit and quality leaves any previous colnago clothing you may own/have owned firmly in the shade. cambiago is in safe sleeves and bib straps. 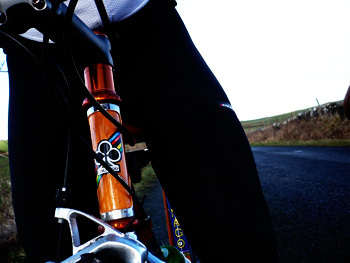 many thanks to peter and luke at colnago uk for their assistance with this review.